Twenty-two Siouxland organizations will co-sponsor Entrepalooza, a ten day celebration of entrepreneurial spirit in Siouxland. The celebration will kick off at 6:30 p.m. Monday, February 15 with “A Conversation with Ted Waitt.” The event will be hosted in the St. Francis Center on Briar Cliff’s campus. Hear Ted talk about his path to entrepreneurship and the history of Gateway Computers. The audience will have the opportunity to ask questions at the end. This event is organized by Briar Cliff’s Enactus team and sponsored by the Siouxland Economic Development Corporation. It is free and open to the public. Leading up to this event, Iowa entrepreneurs can visit ISU Design West from 8:30 a.m. to 1 p.m. on the 15th for “the Journey to Your Vision, an event uniquely designed to help Iowa entrepreneurs uncover opportunities for improving their business. Learn about the stages of business growth and the unique challenges to overcome them. This event is sponsored by Iowa’s West Coast Initiative, Iowa Farm Bureau and CIRAS. Pre-registration is required for this event. The following night, Tuesday, February 16, a Consulting Fair will take place at Western Iowa Tech Community College in the Advanced Sciences Building L416-417. The Fair begins at 6:30 p.m. and will provide free advice to small businesses from business experts. The Small Business Development Center and SCORE sponsor this event. Then, beginning at 5:30 p.m. on Wednesday, February 17th a speed networking event will be hosted at Springboard Coworking in downtown Sioux City. This event, hosted by Morningside College’s Entrepreneurship Group, is a great opportunity for business leaders and students to network. Entrepalooza makes a stop in Le Mars on Thursday, February 18th for Ice Cream Cocktails and Biz Tales. From 6 p.m. to 8 p.m. at P’s Pizza House, attendees will have a chance to network and brain-pick fellow entrepreneurs from Siouxland while treating yourself to ice cream cocktails in the Ice Cream Capital of the World®. On Friday, February 19, the South Sioux City Chamber of Commerce Coffee Hour, taking place from 9:30-10:30am will be hosted by Northeast Community College’s Enactus Group. The coffee hour will focus on the 5th Grade Jump Start Market. It takes place at the College Center in South Sioux City. The public will be able to purchase products created by the students. The following week, Monday, February 22, entrepreneurship activities pick up again with “The Recipe for a Small Business Community.” Listen to Steve Records, VP of Field Operations for SCORE as he explains what it takes for Siouxland to support its small businesses. This will be held at the College Center in South Sioux City and begins at 6:30 pm. SCORE provides free services to entrepreneurs and small businesses. On Tuesday, February 23, a series of events will be hosted at the HoChunk Centre. At 3:30 p.m. Innovation Grow Market, presented by Briar Cliff’s Enactus Team, will enable students participating in an Entrepreneurship class from the three Sioux City Community Schools to pitch their business ideas to Sioux City Growth Organization (SCGO) judges. The judges will make a decision and the winning business receives $200 from Briar Cliff’s Enactus team. At 5pm the Innovation Market, sponsored by SCGO, will follow. Entrepreneurs and business leaders are invited to attend the event. For this one, young professionals are encouraged to submit business ideas that will benefit Siouxland. Innovation Market is a venue for entrepreneurs to showcase their ideas for businesses, community events and non-profits. To submit ideas, visit www.siouxcitygo.com. On Wednesday, February 24 Entrepalooza returns to ISU Design West for the Education Summit. From 4:30 p m. to 5:30p.m., the “Creating Young Entrepreneurs and Innovators” event will be to encourage entrepreneurship education in the area schools. A panel of educators will discuss their experiences with implementing entrepreneurship curriculum into their schools. A question and answer session will follow. This is sponsored by Briar Cliff’s Enactus team. Entrepalooza wraps up on Thursday, February 25. 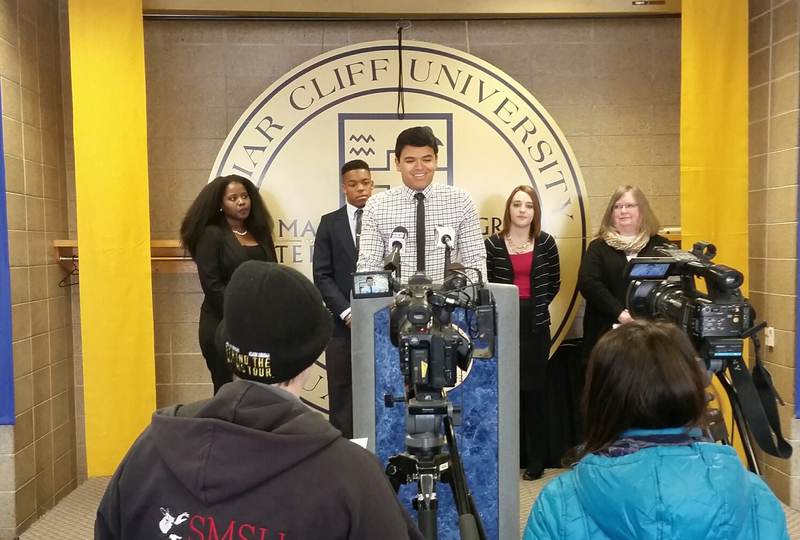 Briar Cliff’s Enactus team will host the annual “Swimming with the Sharks” competition. Presentations and judging for the contest will begin at 6:30pm at Briar Cliff’s St. Francis Center. Finalists will vie for mini-grants valued up to $4,000. Contest prize money will be provided by Siouxland Economic Development Corporation and area economic development offices. For contest rules and applications, visit briarcliff.edu/sharks. Entrepalooza partners include: Briar Cliff University, Enactus, Siouxland Economic Development Corporation, Small Business Development Center, SCORE, Sioux City Growth Organization, Northeast Community College, Morningside College, Western Iowa Tech Community College, Springboard Coworking, Siouxland Chamber of Commerce, Sioux City Economic Development, South Sioux City Economic Development, and Woodbury County Rural Economic Development, LegitDesigns, Startup Sioux City, Le Mars Chamber of Commerce, University of Iowa, Sioux City Community Schools, Iowa’s West Coast Initiative, Iowa Farm Bureau and CIRAS. For more information on any of the events above, visit entrepaloozasiouxland.com/.